My pal Nigel 'did his back in' a few weeks ago an so has been unable to fish until recently. When he rang to ask if I fancied a session at Worbarrow Bay I was quite surprised. clearly the offending back had recovered and he was rarin' to go. It was one of those wonderful hot sunny days we had at the beginning of June and when I walked down the track the few remaining grockles were just leaving. As I arrived at the cliff top I could see the full expanse of shingle curving away into the distance. A single figure was visible in the middle of the bay and although my eyesight is rubbish I guessed that it must be Nigel. The 'route march' along the shifting gravel was just as hard as I remembered from last season and since Nige was casting and moving along as he fished it seemed to be ages before I caught up to him. 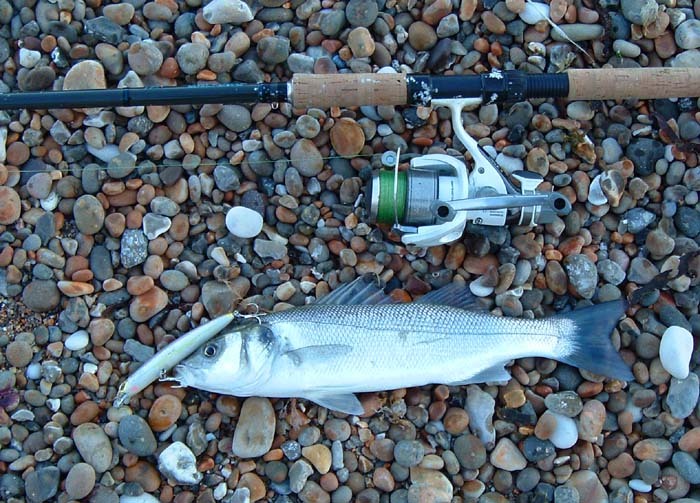 He was spinning with a spoon and had managed one bite which produced a garfish. Since Nigel was using a spoon I clipped on a shallow diving plug - in fact it was the one that Richard had used so successfully last week. 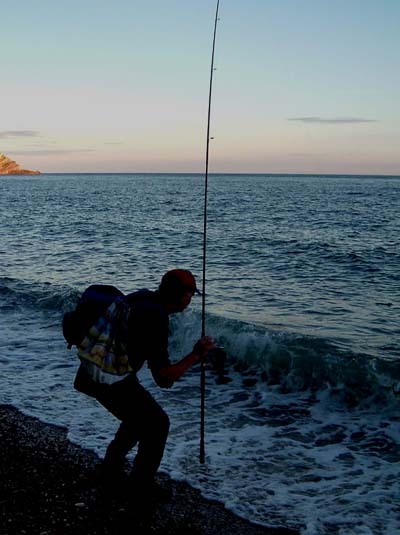 I walked on ahead of Nigel and began to fish. The lure worked nicely although it did not vibrate the rod like a J11 so it was not too easy to tell if it was weeded up. There was a fair bit of floating rubbish in the sea, mostly green slimy sea lettuce. Even a small strand of this stuff seems to kill the lure's action. The weed was in patches and eventually I found a short stretch that was more or less clear. Second cast into the clear water, just as I was about to lift my lure out, it was taken with a fierce yank and I landed a small bass. I held the fish up to show Nigel and he began to walk along towards where I stood. It was not long before each of us had another bass, about the same size as the first. As the sun began to fall below the cliff the breeze dropped away and the sea was very calm. 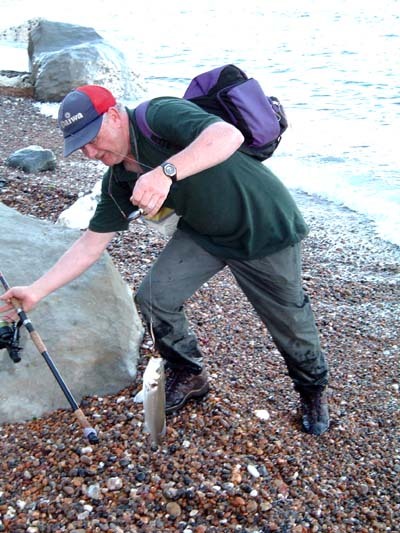 Nigel had a mackerel on his spoon and we packed in started the long walk back to the car. A couple of days later I decided to try an early morning session for mackerel, pollack etc. I took both the fly rod and the spinning rod - just in case. I arrived on the rocks at 3.30 (a.m.) and began with the fly. A few days earlier when I tried the same thing I had blanked so I was not too hopeful. In fact it was only about five minutes before a fish slashed at the little Redgill 'fly' so I was quite encouraged. Five minutes later I had another take and the fish felt reasonably heavy. However, after an initial surge it splashed about a bit and was soon on the rocks. A pollack - a bit bigger than most of the ones I catch down here on the fly. I was chuffed and took a couple of pictures. 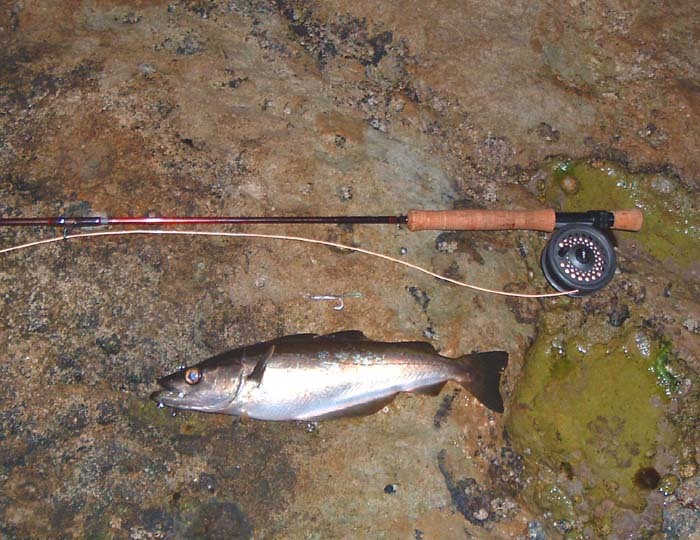 No more bites on the fly so I put a small Toby on the spinning rod and began to fish. Immediately I was into mackerel and after landing and returning a couple I saw the swirls of feeding mackerel a few metres out. I grabbed the fly rod but they had moved off again so back to the spoon and sure enough I caught a few more. This switch of rods was repeated two or three times but as it turned out the only fish I had on the fly was the first pollack. I landed nine mackerel on the spoon and lost quite a few more. All-in-all a good hour's fishing - I'll get them on the fly next time.